Under the Fields tab, click on the Add/Edit Field Rules button. If you have not yet created any field rules, click on No Field Rules Defined. Click to Add One in the Edit Rules window. 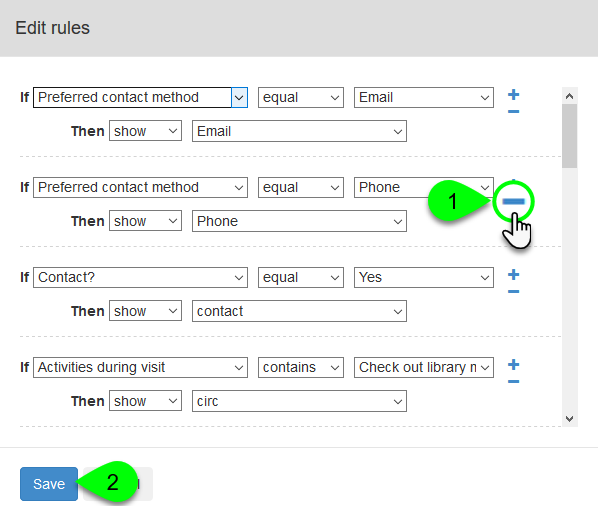 Otherwise, click on the Insert a New Rule Here () icon next to an existing rule. This will insert a new field rule immediately after it. 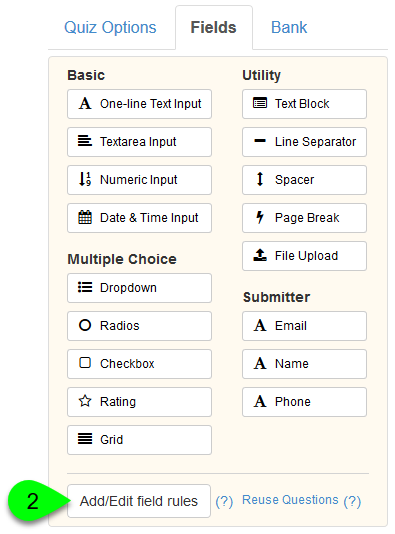 Configure your field rules and click the Save button. Tip: field rules are applied in the order in which they appear and cannot be reordered, so plan carefully! In the If row, create the comparison that you want to make. This "if" statement is what will determine when the rule activates. In the first dropdown, select the field you want to evaluate. If you select Contains, the "if" statement will be true if the value in the third field is contained anywhere in the user's response. If you select Equal, the "if" statement will be true only if the value in the third field matches the user's response exactly. This works best with multiple choice questions. If you select Not Equal, the "if" statement will be true only if the user's response does not exactly match the value in the third field. This works best with multiple choice questions. In the third field, select or enter the value you want to compare to the user's response. If this is a multiple choice field, select the option from the dropdown menu. Otherwise, enter a value in the text field. 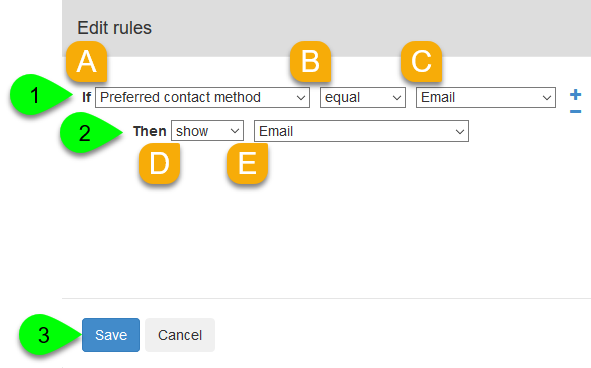 In the Then row, specify the action you want this rule to take. This "then" statement is what will happen when the rule is activated (i.e. when the "if" statement is true). Show a field or group. Hide a field or group. Jump to a field or group (especially helpful if using page breaks). 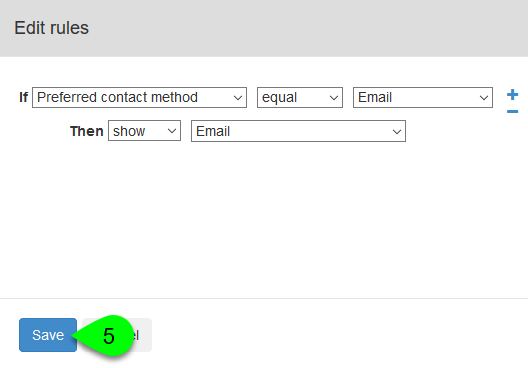 In the second dropdown, select the field or field group that action should apply to. This would be the field that is shown, hidden, or jumped to. Click on the Delete this Rule () icon next to the rule you want to delete.